Established in 1996, SEASL (Saltwater Enthusiasts Association of St. Louis) is the flagship saltwater club in the St. Louis area. They are a group of saltwater enthusiasts who meet regularly to share their knowledge and learn from others about the hobby. While membership is offered and encouraged, there are no membership requirements and everyone is always welcome at the meetings. SEASL meets the second Saturday of the month from September through May, unless otherwise scheduled. Meetings are held at member’s homes so attendee’s gets to see the fantastic reefs we have in St. Louis. Meetings often include coral door prizes and programs include speakers, demonstrations, and an annual trip to Inland Aquatics. At various times during the year, local retailers host an open house for SEASL. Those events get large turnouts. The store-owners give us a tour of their operations, exclusive shopping time, discounts, a summary of their involvement in the hobby, and their personal attention for our questions and comments. The Saint Louis Area Saltwater Hobbyists or SLASH are a group of enthusiasts who are dedicated to the concept that clubs can be fun, informative and helpful, as well as being a great conduit for meeting new friends. SLASH promotes and urges the practices of conservation, proper husbandry technique, ecological responsibility and friendship. The SLASH creed is group participation at every level and every member will be heard. We will make every effort to prove to all members that their opinions are a highly valued and very necessary asset that will help to shape the future of our club. The Saltwater Enthusiasts Association of Springfield (The SEAS), Missouri is comprised of hobbyists who share a common interest in marine aquaria. The club was founded in 2004 and has active participation of around 100 members, with an additional 200 people registered on this forum. The SEAS meets the first Saturday of every month at noon. Meetings are generally held at The Library Center at 4653 S Campbell Avenue. Please check the Club News board for information about upcoming meetings. Members and non-members alike are welcome to attend our meetings. Missouri Aquarium Society welcomes anyone with an interest in aquatic life, from fish to plants. Our members range from beginners to published experts, and we welcome families and children. Please come to a meeting or two as our guest. We will enjoy meeting you! on the third Thursday of every month, at 7:30 PM.Families and spouses of the fish keeper are welcome as well. Our monthly get-togethers begin with a short business meeting, followed by door prizes, a mini auction, refreshments, a raffle, and a program. Past programs have included everything from presentations by internationally known speakers and authors, to educational and fun "fish fact" games. Our Horticultural and Breeders Award Programs are very active, with members bringing in fish and plants they have raised. These specimens are included in our monthly mini-auctions. If you would like to join MASI, dues are $20 per calendar year. This includes 6 issues of our club publication printed, "The Darter". A full year membership that includes an electronic FULL COLOR Darter is only $15.00 After June 30th, dues are $15. The International Society for Reef Studies (ISRS) was founded in 1980 and membership has increased rapidly in recent years. The principal objective of the Society is to promote the production and dissemination of scientific knowledge and understanding of coral reefs, both living and fossil. To achieve its objectives the Society holds annual meetings and co-sponsors other gatherings, prints and distributes the journal Coral Reefs and the newsletter Reef Encounter, and raises funds and receives contributions by way of subscriptions and donations. Coral reefs throughout the world are currently facing significant pressures from global climate change and direct anthropogenic stresses (including overfishing and sedimentation). Managers (industry, government, NGOs etc) are typically making difficult decisions in relation to these issues often without adequate scientific information. Good judgement and objectivity and quality information are badly needed, and in its subject area, the ISRS is in the strongest position internationally to furnish these across the board. The ISRS represents a unique source of substantial expertise and information about coral reefs, many facets of which relate to issues which bear on a much wider community. 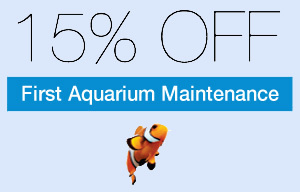 Call or Email Now For Saint Louis area Aquarium Maintenance Services.